Japan’s financial position is the worst among the world’s major developing countries today, and the fairly new Democratic Party of Japan (DPJ) government formed in September 2009 faces the huge challenge of developing major financial retrenchment strategies. This account by the former mayor of a significant Japanese city reports on the financial crisis and explains the development of the idea and the practice of the “New Public Commons”, an innovative approach designed to make central and local governments financially sustainable. The principal agenda of the EROPA 2011 conference was Challenges, Opportunities and Innovation in Public Administration in the Next Decade, and there were three sub-themes: 1) fiscal retrenchment: challenges, opportunities, and innovation in public administration; 2) the role of the state in managing new challenges, opportunities, and innovation; and 3) innovations in public service delivery. 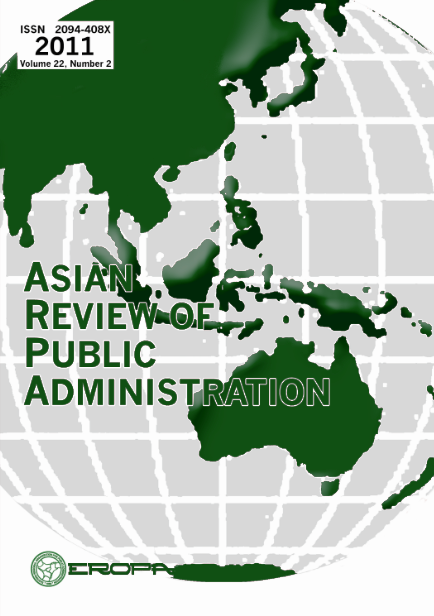 The major agendas and the three sub-themes are all highly germane to current conditions in the Asia and Pacific region. In this part of the world, challenges to governments abound. Some countries are facing political issues, while others must attend to economic problems. Against such backdrops, this article first describes a number of challenges which various governments in Asia are currently confronted with. It then delineates opportunities and innovations which may help alleviate impediments to good government action in the region. The conflict and violence ravaging the world have drawn attention to flaws in the prevailing world development model. Thailand had been doing well according to that model, but it suffered greatly in the East Asian economic crisis of 1997. Out of that experience, it moved to adopt a new model, described as Sufficiency Economy Philosophy (or SEP), that was proposed by the King. This model teaches the need to maintain fiscal discipline and rethink the role of the state, with the people in each local community determining their own sustainable development with an appropriate balance of economic, societal, environmental, and cultural objectives.